Ronda Rousey will make her RAW debut tonight as she takes on Alicia Fox while Angle will address the attack from Brock Lesnar last week. There’s plenty of storylines from the RAW side of things as we approach Summerslam and even some of the mid-card matches have the potential to build into something big. Looking forward to another show, RAW was decent last week and has been building to a good pace heading into the second biggest PPV of the year. Don’t forget to tweet me your thought on what went down tonight! The Raw GM immediately hyped up the Ronda Rousey match between her in Alicia Fox while burying Brock Lesnar. After eating an F5 last week, Kurt explained how Paul Heyman’s job is still intact because Lesnar did, in fact, go to the ring. Angle was on a roll before being interrupted by Roman Reigns, who was removed from the arena last week, prior to the Lesnar attack. The Big Dog was mad about not even being in the building as Angle took the finisher. He then took issue with Corbin who retreated from the ring last week, who fired back saying he had already competed that night. But Corbin interrupted the RAW GM, saying he’s not allowed to pick sides or play favourites. He kept going on, saying that Angle isn’t even the one who runs the show, Stephanie McMahon is still commissioner, and Angle just makes the matches. Of course, Angle then created a match between Roman and Corbin to open RAW. An easy segment to start the show with everyone involved sticking to character well after what went down last week. Corbin’s position gives him the versatility to pick feuds with almost anyone (KO potentially after last week, Roman this week, Balor on-going). A well-paced match with two quick botches early on. Reigns and Corbin both clotheslined each other, with The Constable being the one to fall. Moments later he ducked under Reigns who was coming off the ropes but then collapsed against the ropes, allowing Reigns to hit him over to the ringside area. Reigns is starting to diversify his move set which is a welcome sight heading into Summerslam, given he’s more than likely going to carry the match with Lesnar. Great moment in the match when Corbin slid underneath the ropes and around the ring post, but hit the cameraman and unintentionally knocked him down to the floor. The Constable took a Superman Punch before rolling out of the ring to avoid a spear and started heading up the entrance ramp before Finn Balor’s music hit, forcing Corbin back to the ring. Reigns hit another Superman Punch off the ring steps before hitting a spear inside the ring. A pretty good match between the pair as Corbin continues to impress in his new role while Reigns gathers more momentum. Great work from both superstars outside of the two early botches. After the beating last week, Balor jumped in the ring and hit Carbin with a Coup de Grace and got some payback. I personally don’t mind this feud between Corbin and Balor, as long as Finn doesn’t get buried as usual. A quick video package recapped last week’s match between McIntyre and Rollins before The Architect appeared for a chat with Kurt Angle, who (once again) was pictured standing awkwardly watching a TV monitor. Rollins made the case that he can’t take on both McIntyre and Ziggler because as soon as he gets close to taking one of them out, the other one gets in the way to make the save. Angle told Rollins he just needs to find a tag team partner and he can take on both McIntyre and Ziggler later tonight. Given Reigns wrestled the opening match of the night, I wouldn’t put it past Rollins to choose Roman for the clash. A back and forth match where neither superstar really gained any huge momentum. Rawley didn’t get buried completely with the finish coming off a counter from Roode into the Glorious DDT. The commentators billed this as Roode getting the better of Rawley because of his superior technique and endurance throughout the match, which is an interesting storyline to push. Rawley has been getting a huge push which has really come out of the blue, while Roode has been severely underused and mishandled. A bit of a meta segment from the WWE as a stage manager was consulting Elias on the details of another documentary. Elias told him not to worry about it, because he’s seen it all in his mind and it’s going to be perfect. He told everyone to stop and relax, started playing his guitar and that was that. Elias still getting a hard push from the WWE and is definitely one of the most over stars on the roster right now. Elias went about doing his usual stuff and of course, the crowd loved every bit of it. He played a short piece off the top which was quite soothing actually. He immediately promoted his album and documentary and continued to push his music. He had the camera crew with him because he wanted to re-shoot the documentary his own way. He even gave them stage direction and told them to circle around him while playing. Lashley came out to interrupt Elias as their feud continue and the pair cut a pretty good promo. Finally a little bit of direction with this feud with Elias having a proper reason to have a gripe with Lashley. Elias directed the crew to leave before hitting Bobby with a cheap shot, Lashley turned the tables and told the crew to film him as he hit Elias with a standing suplex. Much better from the two with Lashley even getting some cheers from the crowd. The camera crew seemed a little expendable but was an easy way for Elias to put over his documentary and album without feeling completely contrived. With Rollins searching for a tag team partner, Tyler Breeze threw his hat into the ring and said that Rollins is certainly “passable” if he’s going for the Crossfit Jesus look. He even suggested a new tag name for the pair; Crossfit Breezus. Has a good ring to me if I’m being honest. Breeze put his fist in like for Rollins to follow up but the camera zoomed out to show Roman Reigns who said that he’ll have Rollins’ back later in the night. So, as predicted, Rollins and Reigns teaming up against McIntyre and Ziggler, which should be a great match. The sequel to last week’s match between Akam and Apollo Crews as this feud continues along. Although I feel like they keep getting the off-cuts from the WWE Creative team. Rezar got the win off the distraction from Akam with Titus eating a big boot and spinebuster to secure the win. Pretty disappointing from the creative team to have such a basic finish in order to continue the feud. Having Rezar squash Titus would’ve made things more interesting and given it some direction, as opposed to the classic three-match series between the two teams. Both sides really needed some kind of incentive or motivation and now they’re still lacking. Any chance to get Owens on the mic is great and integrating Mahal into the feud with Braun Strowman has been a welcome one in my opinion. Owens claimed Mahal has helped him relax and relieve some of the stress that Strowman has been causing him. He then brought up how both Mahal and he had both beaten Strowman, something most people haven’t achieved. And beating Strowman at Summerslam will make him “KO in the Bank” and now all of a sudden everyone has a moniker if they have the briefcase. Owens called out Strowman to rather awkwardly set up a match between him and Mahal but then the set started to lift and move. Owens and Mahal fell to the floor as Strowman walked to the ring for his match with Mahal. Jinder was clearly not interested in a rematch with Strowman but took some moments in the ring to calm himself before taking on the Monster Among Men. Owens almost immediately tried to steal the briefcase, Strowman gave chase but didn’t get counted out this time. Owens returned once again to steal the briefcase and legged it up the entrance ramp. Strowman tried ripping the briefcase from Owens’ hands and inadvertently hit Mahal, earning him a DQ loss. Another loss for Strowman that wasn’t via pinfall or submission and the storyline is very close to running stale. The match had a very similar finish with Mahal leaving through the crowd and Strowman’s music playing as he stood tall. Corbin once again walked up to Kurt with Stephanie McMahon on the other line and had a similar interaction last week, teasing some kind of disappointing twist towards the end of the show. Could it be that Roman is being removed from the building again? McIntyre and Ziggler vs Rollins by himself? A nice little video package from the WWE Video team to hype up the match as Corey Graves interviewed Roman. Really well edited together and I gotta give props where it’s due. Roman once again put over the fact the Lesnar has no interest in the WWE and still wants nothing more than a paycheque. As predicted, the phone call was Stephanie saying that Roman isn’t allowed to Rollins’ partner in their match against McIntyre and Ziggler. Once again it was Stephanie trying to protect the Summerslam main event. Roman said he doesn’t care but Corbin reassured him that if he went to the ring, he would forfeit his match against Lesnar at Summerslam. Corbin announced the match would now be a handicap match and Rollins was left to fight by himself… Tyler Breeze anyone?? Roman came back and hit Corbin in the ribs again, which gave the segment a light-hearted finish. Numbers game quickly caught up with Rollins but Seth continued to show signs of life throughout the early stages of the match. McIntyre was taken out of the equation after hitting the ring post and the match quickly turned into a one on one affair. Rollin took control but a hidden tag from McIntyre got him back into the match without Rollins noticing. The momentum turned again and Rollins was hit by a superkick from Dolph to secure the win, however, Ziggler technically wasn’t the legal man to add a little controversy to the match. Not too sure if this was intentional or not but otherwise a good match with Rollins coming close to overcoming the odds. A good way to slow down his momentum before building it again next week. NEW MUSIC FOR THE B TEAM!! NEW MUSIC FOR THE B TEAM!! Finally some more light-hearted music for what’s essentially a comedy act. Definitely suits their characters and it’s a great way to get the crowd involved with some basic high school football chants. The two teams put on a straightforward match before the lights cut and the Deleters of World replaced their tag team partners in each corner. A pretty cool change to the usual “lights go out, superstars appear out of nowhere” gimmick that Wyatt other superstars have done in the past. Good to see Hardy and Wyatt still being integrated and The Revival getting some time on TV too. An emotional interview with Heyman who really pushed the heartbreak angle. He said he’s trying to get to the bottom of things but still consider Brock Lesnar to be a friend of his. Heyman really pushed how upset he was with what happened and always imagined the pair of them riding off into the sunset. Young asked if Heyman would see himself with another client and he spoke about how “inconceivable” this whole situation is. Great interview and promo from both and Young carried herself well throughout the interview. Ruby Riott is back! And finally, The Riott Squad have a little more direction. A repeat from last week which is disappointing and the WWE Women’s Division need a few more tag teams to vary things up. With that being said, it was a strong showing from The Riott Squad, just a shame that Banks and Bayley have all the momentum and crowd behind them. An incredibly close near-fall towards the end as Morgan saved Logan from Banks’ two knees off the top rope. Bayley threw Morgan outside and flew outside the ring but a hooded figure pulled her out of the way. Ruby Riott reveals herself and Logan rolled up Banks inside the ring to pick up the victory as the trio walked up the entrance ramp in delight. A nice change after last week in what could’ve been a disappointing rematch. Before the match proper began, Charly interviewed Alicia Fox and Alexa Bliss and immediately asked about Ronda Rousey’s first Raw match. Before she could finish, Alexa interrupted saying that she could’ve asked a good question, instead of one about Ronda. Fox said that Rousey is probably still hurt after last week. Bliss thanked Fox for everything she’s done for the Women’s Division and how the Evolution PPV wouldn’t exist if it wasn’t for her and it honestly sounded genuine. Bliss continued on by saying that Fox shouldn’t let some rookie come in and run the show, cue Ronda Rousey’s music as the match finally got underway. Fox slipped outside the ring on multiple occasions before distracting the referee as Bliss pulled her down to the floor. Natalya came over to help but was then pushed into the ring post by Bliss. Ronda found her groove and hit Fox with some hard arm drags and then threw her across the ring. The crowd was right behind every move and I underestimated how big of a draw Ronda would be for live crowds too. She locked in the armbar and it was over pretty quick with Fox tapping out. Charly went to interview her but Bliss came in for a quick cheap shot, which Ronda quickly countered. Ronda then jumped on the mic and said “it doesn’t matter how tight you hold that title, because at Summerslam, it’s mine,” before slamming the mic into the mat. And it actually bounced which was cool to see. Strong words from Rousey who could easily pass as the strong and silent type when it comes to the microphone. 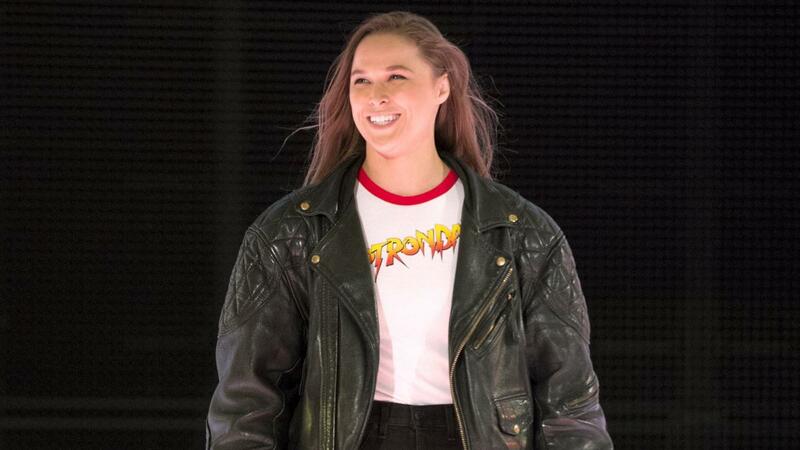 Obviously the WWE didn’t want to use everything at their disposal for Rousey’s first match on Raw, especially with Summerslam around the corner. It was a pretty good episode of Raw with multiple storylines gaining serious traction heading into Summerslam. It’ll be interesting to see what happens with the Tag Team titles with Kurt Angle setting up a triple threat tag match for next week with The Revival taking on The B-Team and the Deleters of Worlds. Surely the B-Team can’t drop the titles just yet? Especially with some cool new music. It was great to see Ronda on Raw performing and the emotional interview from Heyman was certainly a highlight of the night. Let me know your thoughts on Raw and predictions for Smackdown tomorrow on Twitter! Miss out on the action last week? Check out our reaction to Smackdown and Raw.